Winter means snowfall here in Frederick, Maryland. And snowfall can, unfortunately, lead to roof ice dams. Well, ice dams can form on the roof of a home as snow melts and refreezes. Throughout the day, snow can melt on your roof, then refreeze at night, creating a layer of ice that can build up and cause pooling at the base or in the corners of your roof. Now, these ice dams are rather hazardous for your home, and they should be carefully removed as soon as they’re noticed, since they can create a variety of problems. Here are some examples of the problems that winter’s ice dams can cause, as well as some information on what you can do to keep your roof free from this hazard. Even with a roof that is in perfectly good shape, ice dams can create leaks that infiltrate your home. Since ice dams hold water against the roof and flashing of your home, that pooled water can work its way into the cracks between your roofing materials. Eventually, this water can seep through the underlayment of your roof (if you have a roof underlayment), where it will make its way through the decking and into your home. Therefore, it’s crucial to address ice dams right away before they wreak havoc on your abode. Ice dams can damage the roofing material of your house as well. As ice freezes, thaws, and re-freezes, it will swell and shrink. This subtle change can actually have a big impact on your roof, and it may be enough force to tear or crack shingles, and to break wood shakes and thin slate tiles. Regardless of the roofing material that you have installed on your roof. It’s always a good idea to get rid of ice dams before they cause damage. If you have a chimney that doesn’t rest on the ridge of your home (where it will likely be safe from ice dams), then your chimney may actually cause ice dams itself — and in turn, these ice dams can damage your chimney. Be especially wary if your chimney rests in a concave corner of your roof, or if the chimney is close to a lower edge of your roof. Here, chimneys can create pooling and ice dams more easily. Flashing is a protective layer that is applied to the edges of roofs and it abuts various elements that penetrate the surface of a roof (including the chimney, vents, and other components). However, like the other protective materials of your roof, flashing is liable to become damaged if it is exposed to ice dams. 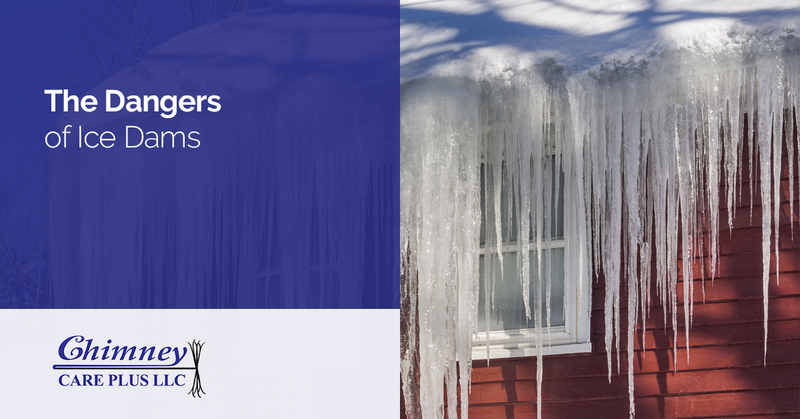 Ice dams can bend flashing, leaving gaps for water to penetrate your roof. In addition, ice dams can force your flashing to lose its adherence to your roof and its components, which will cause leaking. Gutters can easily be damaged by ice dams. Again, since ice dams expand and contract, they can bend your gutters, or they may cause them to detach from your home. In addition, heavy ice dams can cause your gutters to fail and fall off completely. If you’ve notice that you have ice dams on your roof, it’s wise to take care of them right away. Otherwise, they are liable to grow in size as storms pass by, and they will create problems as the freeze and thaw. Our advice is to stay on top of roof snow removal as much as possible. Hire a roof snow removal team to get rid of any snow that is liable to stay on your roof for the duration of the winter. Also, if you have noticed that your roof has ice dams, you should call a crew that specializes in safely removing ice dams. Professional removers will be able to get rid of damaging ice dams without further damaging your roof. It’s best not to attempt to remove an ice dam yourself, since it can be a safety hazard, and you’re liable to tear up your roof in trying to remove the ice. If winter’s ice dams have left your chimney damaged, we’re always here to provide repalrs. We can tuckpoint your chimney and repair its flashing to ensure that it is sound and ready for another winter. Reach out to us today to learn how we can repair your chimney.